George Whitty has developed a vast library with hundreds of online jazz piano lessons. Students have unlimited access to the interactive jazz course, which includes backing tracks, sheet music, piano presets, and much more. Learn jazz from a master of the genre. What ultimately sets these jazz piano lessons apart from other offerings is the ability to submit a video for review using the ArtistWorks Video Exchange Learning® platform. George reviews each submission and records a video response, offering specific guidance to take your jazz piano playing to the next level. All students can access the Video Exchange library and watch each other’s interactions with George. This library is constantly expanding and may contain the key to unlock your playing. 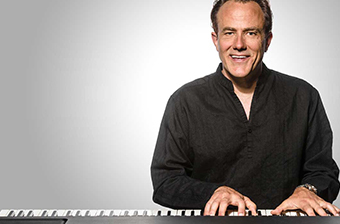 George Whitty is a multi-Grammy® and Emmy® award winning jazz piano player. He has worked with a long list of top recording artists who include Herbie Hancock, Wayne Shorter, Michael and Randy Brecker, Chaka Khan, Carlos Santana, Celine Dion, and more. As a talented producer, arranger, and composer, he has worked on a wide variety of projects which include orchestral scoring for films and composing music for hundreds of television episodes. George has a long history as an educator having taught at masterclasses and clinics in more than 20 countries around the world, teaching jazz piano as well as sharing his expertise on producing and scoring music. “Linus & Lucy” (Charlie Brown Theme Song) -NEW! Not so many years ago you couln´t imagine being able to talk and have instructional feedback from your music idol!!! now it´s possible! !